Claim: sugarcane ethanol can replace 13.7% of global oil supply | Watts Up With That? Expansion of sugarcane cultivation in Brazil for ethanol production in areas not under environmental protection or reserved for food production could potentially replace up to 13.7% of world crude oil consumption and reduce global emissions of carbon dioxide (CO2) by as much as 5.6% by 2045. These estimates come from an international study with Brazilian participation, whose results were published on October 2017 in the journal Nature Climate Change. The study set out to investigate how the expansion of sugarcane ethanol could help limit the rise in average global temperatures to less than 2 °C by reducing CO2 emissions from the combustion of fossil fuels, as agreed by the 196 countries that signed the Paris Climate Agreement in December 2015. The study was conducted as part of a project supported by the São Paulo Research Foundation – FAPESP and by the National Institute of Science and Technology for Bioethanol – INCT Bioethanol. The participating researchers are affiliated with the University of Campinas’s Agricultural Engineering School (FEAGRI-UNICAMP) and the University of São Paulo’s Bioscience Institute (IB-USP) and Luiz de Queiroz College of Agriculture (ESALQ-USP). They collaborated with colleagues at the University of Illinois Urbana-Champaign (UIUC), Iowa State University and the National Center for Supercomputing Applications in the United States, the University of Copenhagen and Danish Energy Association in Denmark, and Lancaster University in the United Kingdom. The researchers used software developed at UIUC to simulate the growth of plants such as sugarcane hour by hour based on soil composition, temperature, rainfall, and drought, among other parameters. They used three different environmental policy scenarios to simulate sugarcane expansion in the context of climate change projected for 2040 and 2050 by the five main general circulation models. Scenario 3 was the same except that it included natural and semi-natural vegetation that can be legally converted to cropland. All three scenarios excluded environmentally sensitive areas such as the Amazon and Pantanal, which cannot be used for agricultural or industrial activities. November 29, 2017 in biofuels. Too late. Wind and solar have won. We’ll be off gas and oil by Christmas. Haha. Yes, apparently the Brazilians have found a solution to a problem that doesn’t (or won’t) exist due to the expansion of electric cars and renewable energy production. Oh, and hey, Leopoldo, do you happen to have any relation to the cigar maker? ripshin – electric cars and renewable energy are complete jokes and are not the solution to any problem, particularly as CO2 is desirable and less is bad. As the planet cools, we will need the growth stimulation that more CO2 can produce. These idiots are dangerous. The problem they’re focusing on is from CO2 emissions, not from running out of oil. This ‘problem’ doesn’t exist due to the expansion of electric cars and renewable energy production, but simply doesn’t exist. Yeah, sorry, should’ve included a /sarc tag…and I’m fairly well aligned with both of you. This was simply a quick off-the-cuff comment. The November 2017 issue of the IEEE Spectrum magazine included an article on a utility grade storage battery that is a much better technology for storing intermittent power than large assemblages of Tesla Power Walls. The Vanadium Redox Flow Battery may just get the electric vehicle to take off in ways that the lithium-ion battery cannot. 1) Plug it in and recharge the electrolyte by running the VRFB in reverse. 2) Swap out the discharged electrolyte for fully charged electrolyte. Admittedly, this will require some system to prevent someone swapping out the solvent (water) for the charged electrolyte solution. A combination of 1) and 2) is a stationary utility scale VRFB that charges the vehicle’s electrolyte solution at a much faster rate than the vehicle’s much smaller VRFB battery. This is the other advantage of the VRFB over the Li-ion battery, the energy available in the VRFB does not depend on the volume of the electrodes. As the electrodes of a VRFB are not involved in the electro-chemical reactions, they last much longer than the electrodes in a Li-ion battery (The lifetime of the electrodes in a Li-ion battery depend on how well the atoms added back to the electrode in the recharge cycle end up where the atoms were removed in the discharge cycle). There is always another miracle battery just over the horizon, always has been and always will be. The reason being that no matter what exotic materials and geometries you may use you are in the end limited to reversible low-temperature redox reactions, and there is only so much electricity that can be extracted by pushing around loosely bound valence electrons. That said a flow battery has definite good points, particularly that it can be quickly “re-charged” and the logistics of shipping the electrolyte solution to and from “filling statuions” is vastly simpler and cheaper than rebuilding the entire low-voltage network which would be needed for “home re-charging”. The main drawback is the low energy density of the electrolyte. To get a decent range an humunguos “fuel tank” will be needed. And while the total energy of the battery is not dependent on the electrode volume the maximum power most definitely is. Even as a solution for stationary applications it reeks. Even more so for mobile; the weight per kW-hr is huge. And the cost is about $1-2/watt-hr. A Vanadium Redox Flow battery was installed in 2003 as a battery backup system on King Island, Tasmania, a few years ago. The system failed and was removed. Hydro Tasmania’s statement was that it was “…not robust enough and failed after a relatively short life. Investigation into restoring the VRB concluded it was not eaconomically viable to restore…”. Storage is expensive per se, because a storage is 3-in-1 device combining production AND storage AND consummation (so: ~twice the cost in best case scenario), that doesn’t even produce of it’s own but consume at every conversion step, so another device is STILL required to do the real production (so: ~thrice the cost). It make lots of sense to use storage to cope with small peaks by taking advantage of worthless available production in low demand period. It makes no sense, even with some sort of “miracle” storage, to use it as backbone : a device really producing when needed will be simpler, cheaper, and required anyway. And, as matter of electricity nothing beats hydro, nothing beat pumped hydro storage, but, remember, the thing produce nothing, it even net consume. Pumped hydro storage works pretty well. Unfortunately there are few suitable sites for building them. The burning was done before cutting, a practice that cleaned up the cane and rats before hand cutting. It was a tough enough job without these extra difficulties. They now harvest “green stick” but it needs more power [ergo fuel consumption] to clean the stalks because the mills penalise for dirty cane. Their analyses seem to fail immediately. Combustion of hydrocarbon fuel will cause generation of CO2, regardless of the fuel. Since bio-fuels have less energy density than petroleum fuels, more biofuels will need to be consumed to produce the equivalent energy from petroleum fuels. Therefore if we immediately switched from petroleum based fuels to ethanol it would increase the amount of CO2 emitted. If reduction in CO2 were actually the goal then it would be irrational to use a fuel that created more CO2/BTU. I don’t think ethanol Is the answer to CO2 or climate change, but I think you missed part of the argument for ethanol. It is true that more ethanol needs to be burned to get the same power as a given amount of oil/gas, BUT with the ethanol more sugarcane will be grown sucking the CO2 back out of the air, while with oil/gas more will be pumped out of the ground and burnt. So with ethanol the CO2 goes through a cycle of plant absorption-burn as fuel-atmosphere-plant absorption and so over time the amount of CO2 emitted minus the amount re-absorbed by the new cane will be less than the burning of more and more oil. Well, given that Brazil has significantly lowered their gasoline usage by using sugarcane ethanol, it’s not as far fetched as you might think. Unlike most biofuels, sugarcane ethanol is significantly net positive on energy because it’s so easy to grow and turn into booze. Certainly it’s a lot better than American corn ethanol. So Ben why is Texas not meeting the US mandate with Texas sugar cane? I have no idea. All I know is that we don’t have any sugar fields in Sugarland anymore. Foreign (Brazilian ?) sugar/ethanol is cheaper (USA don’t have any technical edge anymore, only more expensive labor; and shipping is so cheap nowadays…), and fossil-fuel based ethanol is even cheaper. In their analysis, do they include the fuel used to till the land, water the crop, harvest and process the cane? Very good questions and what about the fertilizer? Its so much better to use the land to fuel cars than feed people?sarc. Ethanol has virtually no benefit in the internal combustion engine. In fact, the exact opposite is true when considering all of the factors. Ethanol is highly corrosive to engines, has virtually (and sometimes detrimental) effect on emissions, and significantly raises food prices. Not to mention that is reduces vehicle fuel mileage. It’s a scam that has been foisted on the public for decades. No, fewer cars (by destroying them), less traveling (from lower mileage), and fewer people (by making food more expensive) are all goals of the UN’s Agenda 21. They could not care less about emission effects. Industrial hemp is far superior as a bio fuel. Easy to grow, requires little water and no pesticides. It is very dry so no moisture inside the engine to rust it. It can be an amazing cash crop for Florida if the old farts in Washington would learn about it and lift the ban on growing it. Industrial hemp was one of the largest agriculture crops the world had known until the mid 1930’s. In 1938, hemp was called ‘Billion Dollar Crop.’ It was the first time a cash crop had a business potential to exceed a billion dollars. It literally had thousands of uses, and the modern world to that point had been largely built on industrial hemp products. For thousands of years, 90% of all ships’ sails and rope were made from hemp. The word ‘canvas’ comes from the Middle English word “canevas” which comes from the Latin word cannabis. Henry Ford’s first Model-T was built to run on hemp gasoline and the car itself was constructed from hemp. On his large estate, Ford was photographed among his hemp fields. The car, ‘grown from the soil,’ had hemp plastic panels whose impact strength was 10 times stronger than steel. Sort of sad to see people here diss anything bio-crop unless it is food. Earthling. You need to take off your rose colored glasses. You were fine until the third paragraph. From everything I’ve heard, hemp makes for wonderful rope and canvas. However, do you really believe “hemp plastic” is that strong? Seriously? Stronger than Titanium? I can guess what you’ve been smoking. As far hemp-made gasoline being that dry, I doubt it. The fermentation process takes up large amounts of water because all the microbes are aquatic. The limit is the hydrophilic nature of alcohol, not the source. It’s nonsense like that which makes people doubt you. Ben of Houston, I think the key word in paragraph 3 was that Henry Ford’s first Model-T was built to run on hemp gasoline. The Model T was very robust, and could withstand a lot of stuff that today’s engines could not tolerate. So it could run just fine on hemp gasoline and it did do so in the very early years. Regarding the strength of hemp plastic, I said Impact strength, not compression strength or tensile strength. Have you not seen videos of sledge hammer tests on hemp ‘plastic’ body panels vs. steel panel body panels? And why the ad hominem on me accusing me of smoking pot? Grow up Ben…you can do better than that. Ben of Houston, good information on industrial hemp. Gasoline is wet, a liquid, no matter what it’s made from. By calling it dry I’m guessing you mean it contains no water, like petroleum based gasoline. But here’s the real problem – where will you get all that hemp? How many hundreds of millions of acres would be needed to grow it? How many of the world’s poorest people would go hungry because food production was replaced with fuel production? Better we should us petroleum for fuels. These strength comparisons are on a per unit weight basis. Kevlar, for example, is 5x stronger than steel. However, a cable of Kevlar as strong as a 1/4″ steel rope is the size of a hawser. I read that in American colonial times a law was passed requiring all land owners to grow hemp. Years ago a friend of mine who knows someone close to the North Carolina Ag commissioner said that the state was close to legalizing the growth of industrial hemp. I don’t know where it went from there. IMO it’s really a crime that it’s illegal to grow such a useful resource. Yes North Carolina is moving towards this goal. North Carolina is where the largest hemp processing plant in the western hemisphere has just been built. Hopes are that as more and more States move to allow growing of hemp, this plant will become very profitable. You can get more information about this by googling the stock HEMP. It is currently a penny stock on the OTCB exchange. Still not sure if it is a pump and dump stock though. canevas as just nothing to do with latin cannabis. More likely related to latin “catena” (also ->chain), used for thread of a weaving, but also used to call the whole crude product and anything done with it, just like thread in english. Actually, ethanol has a much higher octane rating than unleaded gasoline, and can be used in very high compression ratio engines – with above diesel efficiency. However, I don’t think its best use is in an IC engine. It could better be used in a direct ethanol fuel cell car. Even at 17% cell efficiency (20% to 40% is thought possible), a tank of ethanol equal in weight to an 85 kW-hr Tesla batter pack could propel a car more than 1,500 miles. when we were in Brazil every car has a spare fuel tank in the trunk for the fuel de jour. made it hell getting the luggage in the taxi. Question, can the world grow enough sugar cane to replace 13.7% of the fuel supply. Can it be done with sugar cane, maybe. Should it be done with sugar cane, not likely. Especially if you like open spaces and trees. I remember when the Greens wanted to SAVE the Rainforests, not clearcut them to make biofuel plantations. I was thinking how much land would that take. Unfortunately article is paywalled so I am never going to know. In my mind I was seeing the entire Brazilian rain forest cleared for farmland. There is a plenty of space in Canada and Siberia – but it is too cold for sugar cane. A genetic modification would be needed, but we should not even mention genetic modifications. I once figured out that if all the cropland in the US were converted to corn for making ethanol, it would only replace 1/2 of our ( the US not the world ) gasoline use. That should give you some idea of how much land would be necessary. corn ethanol is very efficient at turning poor famers into millionaires in the US. sugar cane cannot compete against sugar beets. as a result you can buy cane fields in Hawaii for next to nothing. If that is the case, why does the US have to limit how much sugar can be imported? To protect the US sugar industry. Actually I’m pretty sure it’s the corn sweetener industry and not the sugar industry that pays to block foreign sugar out of the US. It’s why Mexican bottled Coke is so sought after here. The make it with cane sugar instead of corn sweetener. Sugar beets are the ones that need protection from sugar cane, not the other way around. Natural sugar prices are too low to support sugar beet production, but most of America is too cold to support sugar cane. In Mexico, they have lots of sugar cane, and due to the lack of price floors, it’s cheaper to use sugar cane than to process corn syrup. Actually, it doesn‘t have to limit sugar imports, ……. but iffen those elected US politicians want to continue being elected, it is best to stay on friendly terms with those millionaire ex-Cubans who fled their sugar plantations to escape to the US when Castro took control ….. and who are now in control of sugar cane sugar production along the Gulf Coast. I find that hard to believe when most of the north east coast of Australia is planted with sugarcane, and it’s the main source of income apart from coal. Well, we do have the machinery now to wood chip away the entire Amazon basin and send it as wood pellets to Europe for feel good green schemes. After that clear cut is done we can grow sugar cane on the barren landscape. BTW how has Brazil responded in the past for international calls for halting new road construction and other major development in the Amazon? Oh, excellent idea! I’m quite certain there will be no significant environmemtal ramifications to stripping the entire Brazilian Amazon rainforest and replacing it with sugar cane! A perfect liberal solution to an invented problem. What a coincidence that their “solution” to the “problem” of “climate change” just so happens to be one that will make them feelthy steenkin’ reech. How much diesel is required to cultivate the crops? How much natural gas is required to distill the Ethanol? How much additional water is required to grow the cane and produce the ethanol? How is the expended wart disposed of? It seems there is some un-accounted for CO2 left on the table. Didn’t Venezuela try that years ago and they had fuel shortages until they struck oil. Now they have shortages because the government can’t pump the known reserves that they have let alone refine it. STARVE SOME OF THE THE WORLD to maybe reduce the CO2 emissions by 5.6%. Sounds like very “Green” idea. Why the hell are these people so bent on reducing CO2, consequently reducing foodstuff production worldwide? This is where putting your ladder against the wrong wall puts you in a well and not on a lookout. One of the most environmentally polluting and destructive crops you can grow…. I find the claim that clearing carbon sink land for energy intensive cultivation undoubtably requiring Haber–Bosch derived fertilizers to be net CO2 negative to be unrealistic. Another dumb Green idea to solve a non-problem. Hey, two points : CO2 levels are stagnant, so quit trying to reduce them and 2) electric cars don’t require liquid fuels. Where are CO2 levels stagnant? Only in western countries. In developing countries, they are soaring. Use the sugar cane to grown ant colonies. There are some ant species that have high concentrations of formic acid when collected and ground down. Just harvest formic acid from ants. The formic acid can then be used make hydrogen gas to run in fuel cells. Ants are going to take over the world anyway at point. Might as well put them to good use in an SUV today. When they do take over, they will be coming after you following that proposal. “….Production of fuel ethanol from sugarcane in Brazil is far more efficient than corn ethanol production, they argue. Its CO2 emissions correspond to only 14% of oil’s. Moreover, emissions resulting from land-use change to sugarcane cultivation can be offset in just two to eight years…..”. I believe I recall reading in an issue of Car & Driver many years ago that ethanol has about 30-33% less energy content than gasoline. If that is so, it brings up the question that has probably been asked before: Does a gallon of ethanol (either from corn or sugarcane) have greater energy content than the amount of energy (probably from fossil fuels) expended to produce it? I admit I haven’t spent much time looking for a definitive answer to that question. If anyone knows the answer or can post the link to an objective study on the subject, I would appreciate it. I have been wondering about this for some time. At any rate, the redirection of corn to ethanol production here in the U.S. has driven up the price of ground beef to the point where I am buying ground turkey as an alternative (not to mention all ground water that ethanol production probably uses). American corn farmers probably have enough political clout to prevent the federal govt’s ethanol mandate from ending any time soon, so whether the program makes any economic sense is probably beside the point for politicians. In Brazil, the answer is yes. They’ve managed to do it through the easy processing of sugar cane, which makes more ethanol per acre than corn and is far easier to grow and process. Unless there has been a huge case of hiding the data (and I confess, I’m going off news and news articles, not audited reports), it’s been a fairly strong success to replace domestic imports of oil with sugarcane ethanol. Brazil does not import oil, it is a large and growing exporter. As a matter of fact Brazil is in the lead technically when it comes to very deep “sub-salt” drilling. “….Recently, Patzek published a fifty-page study on the subject in the journal Critical Reviews in Plant Science. This time, he factored in the myriad energy inputs required by industrial agriculture, from the amount of fuel used to produce fertilizers and corn seeds to the transportation and wastewater disposal costs. All told, he believes that the cumulative energy consumed in corn farming and ethanol production is six times greater than what the end product provides your car engine in terms of power…”. Thanks for the UC Berkeley idea of politically correct science. On a mass basis, ethanol produces about 40% less energy when burned than gasoline. On a volume basis, the difference is less (about 30%), because a gallon of ethanol is more dense (heavier) than a gallon of gasoline. Ethanol from corn is a net energy loser, because the energy consumption of fossil fuels (mostly diesel fuel in planting and harvesting machines) used to grow corn represents about 80% of the energy obtained from the ethanol. From a strict energy standpoint, it’s better to burn pure ethanol-free gasoline than blend it with ethanol from corn, and use the corn for food (since people and animals can eat corn, but can’t drink gasoline). Ethanol production from sugar cane is much more efficient, because a higher fraction of the mass of the sugar cane plant is converted to ethanol than corn, whose stalks and leaves go to waste. Ethanol from sugar cane might be viable for those wishing to use a renewable fuel to replace a finite resource of crude oil, which may eventually run out in several centuries. For those wanting to reduce CO2 emissions “to avoid global warming”, ethanol is not the answer. Burning one mole of ethanol (46 g) produces 2 moles (88 g) of CO2, and the heat of combustion is 26.819 megajoules/kg, so that the CO2 produced per MJ of energy released is (1000/26.819) * 88/46 = 71.3 g CO2 per MJ energy. If we consider gasoline to be iso-octane (2,2,4-trimethylpentane), burning one mole (114 g) of iso-octane produces 8 moles (352 g) of CO2, and the heat of combustion is 43.343 MJ/kg, so that the CO2 produced per MJ of energy released is (1000/44.343) * 352/114 = 69.6 g CO2 / MJ energy. Gasoline actually consists of many different hydrocarbons, whose heats of combustion per carbon atom vary slightly, so that the CO2 release per MJ of energy for gasoline may be a few percent above or below the 69.6 g/MJ calculated above for iso-octane. But this calculation shows that, for a given amount of energy produced, burning ethanol emits about the same amount of CO2 as burning gasoline, so that substituting ethanol for gasoline does NOT reduce CO2 emissions or prevent “global warming”. Since this energy was originally sequestered from the atmosphere as the sugarcane plant grew, the correct accounting for the (direct) emissions from burning sugarcane ethanol is “zero”. There may be indirect emissions from the fuel used to grow and process the biofuel itself, but the direct release of CO2 during combustion is irrelevant. Val Ryland, I know that the equation of “new” CO2 in the atmosphere plays the silly game that posits that if a plant that has sequestered CO2 from the atmosphere is burned, no new CO2 is being introduced. But all the coal and probably (arguably) all the oil we burn once used to be plant matter, too. All the methane released by melting permafrost is decaying plant matter, too. Burning fossil fuels is returning naturally occurring CO2 back into an environment that seeks to sequester it through living creatures on land and more readily in the oceans, as calcium carbonates readily sink to the bottom of the ocean after the animals that made the shells die. We need this CO2 back in production. And the sooner, the better. An atmospheric concentration of 1000 ppm CO2 will bring about a huge net positive for all living systems on this planet. The cycle of growth and decay will keep some of it in the air, longer, and that’s all to the good. Meanwhile, to the point of those arguing for this as a future solution to fossil fuel scarcity, we can and we will work out systems for liquid and or battery powered transport when the economics of those new systems will make sense. But we cannot now predict the discount rate for any future economic system that defies common sense and supply and demand in today’s realities. I’ll make one additional small tiny leap, not directed at you in particular, Mr. Ryland, but at Utopians who think they are successful predictors and futurists. We will never succeed in creating a Soviet style economy that claims we MUST change everything now to turn some socialist utopian fantasy into a current economic reality. That was what caused the Holodomor and the Chinese “cultural revolution, and supplied the impetus for Eugenics movements and the “final solution” in Germany. Wake TF UP! The politics of wanting something very badly, and thinking some totalitarian system of imposing it on everyone will lead to some Utopian result has proven to be a disaster, over and over. Why do you want to keep going to that same well? Free markets will do the job better than your prophetic ideas ever will. New free market solutions will undoubtedly be imperfect, just like they are in this time. But they will be imperfections of which you are entirely ignorant. You cannot now predict them.. And most of them will provide new opportunities for enterprising people of the future. I ask you to please, please, please have a little faith in your fellow man, and that in the future, smart and free people will be able to solve and mitigate their own problems. Because for them it will be a necessity, and for you, now, not knowing jack squat about what their world will be like, it is pointless virtue signalling, devoid of value. Efficiency of food production has increased tremendously (and there is still room for improvement), so land area used by agriculture should have started to decrease two or three decades ago, in spite of increasing demand for food. It did not happen, because of the ever larger proportion of cropland used for biofuel production. At the same time croplands are far more devastating to the environment in general, than anything else, including coal, oil &. natural gas or gen IV nuclear reactors, only solar PV &. wind farms come close with their enormous land use footprints. With no biofuel craziness we could give large swaths of land back to nature and create ample refuge for many wild species. As it is, we can’t. What is more, they even propose to extend land area used for agricultural purposes. I think we are starting a pattern here among the Paris Agreement signers: 1) Island resort nations asking for hotel and airport investments, 2) Brazil asking for global use of its large ethanol product……. Sarcasm aside, hemp rope is the best. Soft, strong and it doesn’t rot. Instead of car and truck fuel, I suggest the sugar cane distillate, otherwise known as rum or in Portuguese, Chacaca, be bottled and sold at the price of fuel. Someone tell Gov. Brown of California. Ethanol from sugarcane does better with the states low carbon fuel standard (LCFS) as opposed to ethanol from corn. That way, Brazil can export sugarcane based ethanol to California at an artificially high price and the Brazilians can import corn based ethanol at a discount. Looks like a good investment opportunity for someone. Especially if a salt-tolerant variety of sugar cane can be developed to grow near the Earth’s thousands of miles of seashore, perhaps in Baja California, Chile, Australia, or Morocco..
Getting the price below $25 per barrel of oil energy equivalent would be a blessing. Cane sugar has never been grown in my town but sugar beets have been. How would work using sugar from sugar beets? Let the market prevail here and use the sugar where it will command the best price. What we really need is a process that will efficiently convert any organic matter to a usable, easy to store and use fuel. We must also deal with the reality that there is no real evidence that CO2 has any effect on climate and plenty of scientific rational to support the idea that the climate sensivity of CO2 is really zero. Tax $$$$$ have been wasted on this effort for about 20 years or more, unfortunately the biofuels advocates have not come to grips with thermodynamics and economics . I have to admit that I even received consider remuneration on several projects mostly with private capital in this vain attempt, but not recently since it appears that private capital learned early what government employees have yet to realize. Are you aware that the US Navy has purchased biofuel under Obama mandate at $26/gallon and even up to hundreds of dollars per gallon in the name of sustainability. Hope Trump ends the nonsense. And when the cop says “I smell alcohol” you just claim you were filling your tank. And produce 50% more CO2 while doing it. So if ethanol gives about 60% of the mpg that C6 – C12 gasoline gives, does that mean that its really only 8.2%? 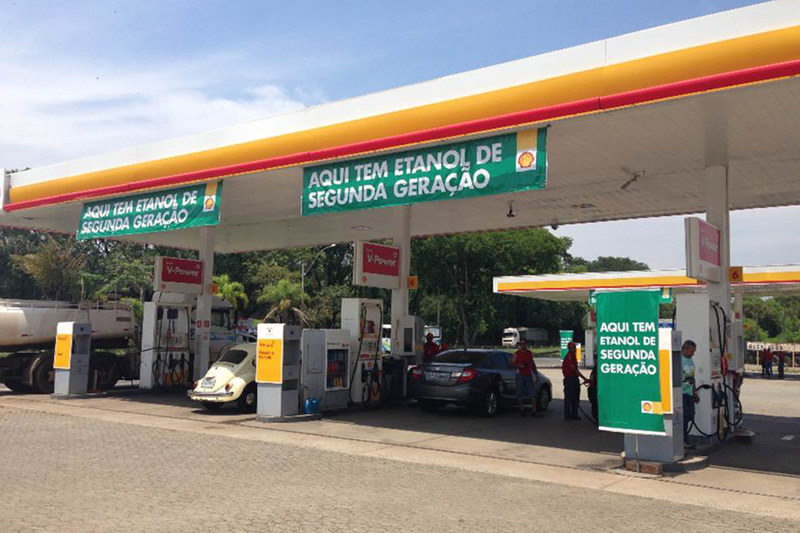 I worked in Brazil around 1980 when they subsided the difference in price for ethanol vs gasoline… I was lucky, I bought a gasoline car just by chance. Then when Brazil ran out of other peoples money, there were “ethanol cars” just parked by the side of many roads – abandoned and rusting. I was able to sell my gasoline car at the end of the project for 50% more than I paid. Does this “Brazilian solution” involve clear-cutting the rest of the rainforest? Ha! Next they’ll be claiming Brazilians don’t have pubic hair! Photosynthesis is a very good way to produce high value chemical products known as “food”, after humans spend millennia in finding and improving special crops and animals for this purpose. However, using just to produce the basic commodity known as “energy” seems one of the stupidest idea on Earth, as long as you can do otherwise; and you can! It takes governments to have it happen: says it all. How long could one grow sugar cane as a monoculture with substantial inputs of fertiliser and energy used for planting and harvesting, assuming that some poor serf doesn’t have to do it all by hand? What will be the effect on biodiversity? Will there be a risk of a fungal or bacterial disease killing off the cane, then oops! No fuel. Also the Greens are great proponents of organic farming where one has to use fertility building crops in a rotation before growing exploitive crops such as wheat. How will they accept the disregard of all their principles in order to save a minimal amount of CO2? Yes, and billions of gerbils on little wheels could supply that much energy, too. It wouldn’t be a good idea either. Used to be that Greenies worried about the Amazon. Strange what mass hysteria can do. So the Euronordics could have a little table sugar and some rum to wash it down with, the Virgin Islands in the Caribbean endured ~150 years of cane cultivation. Hiking in the clear pleasant forests around the untillable fringes of the overgrown plantations I got a glimpse of the islands’ aboriginal aboreals… a sustainable mix neither dense forest nor jungle nor desert, full of life. Reclaimed cane lands on the South and East sides of the islands are now dry thorny tangles, what soil is left gets carried away as loose dust and washout. Erosion is rampant. It wasn’t the cane itself so much as the clearing to make way for it. The islands I knew had been transformed by it, and not in a good way.